State and local police have been serving up lasagna, chicken parmigiana, and pizza this holiday season to help support local families struggling with the financial burden of childhood cancer treatment. On Wednesday, State Police presented the not-for-profit group Cops for Kids with Cancer with a check for $17,300. The money was raised at a benefit dinner last Thursday hosted by Mamma Mia’s of Marshfield. “If you can give to a charity that is going to help a family during the biggest crisis in their life, what better thing is there to give to,” said State Police Lieutenant Colonel Thomas Grenham, who helped organize and staff the dinner. The event quickly fell into place after Mamma Mia’s managers offered to host, Grenham said. From there, State Police joined forces with Marshfield police to help serve attendees and run the raffles and silent auction. “We also had a lot of people who just donated money to us,” Grenham said. 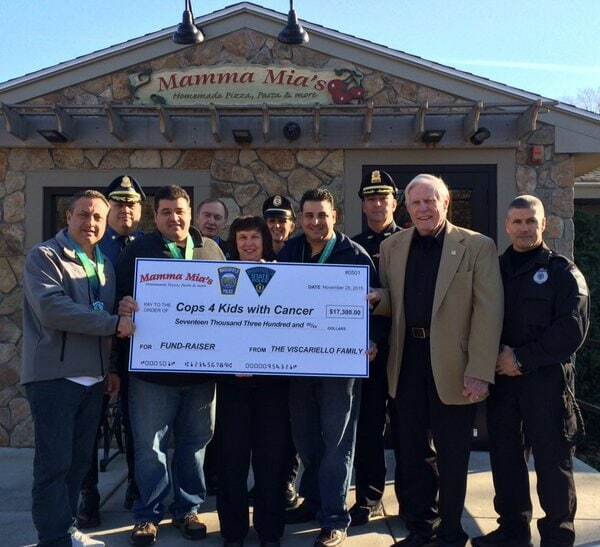 Cops for Kids with Cancer typically donates $5,000 to families with children who have cancer. The money the group donates is intended to help with everyday costs such as transportation and food, while parents are balancing work with hospital visits and school events. Grenham said he understands first-hand how the organization can help families in need; a week before his daughter Shannon’s third birthday, she was diagnosed with leukemia. Funds from Cops for Kids with Cancer aided the Grenham’s financial situation while Shannon received treatment, he said. Shannon, now a healthy, basketball-playing 12-year-old, was bouncing around the benefit last week, excited to help other families experiencing the same thing her parents did when she was a toddler.